A recent product that Inoplas has been developing with a new customer is the Moover cow slipper. It has been in development for just under a year and this month we have run our first samples from the tool. 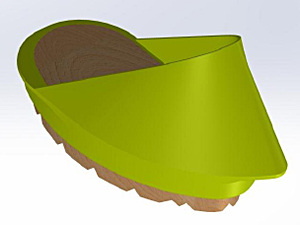 The slipper is designed for dairy cows, who have a problem in one of their hoof “claws”. The slipper allows the infected “claw” to be raised off the ground and heal quickly. This cost effective solution avoids the cow going lame and reduces costs to the farmer both for treatment and in reduced milk production. 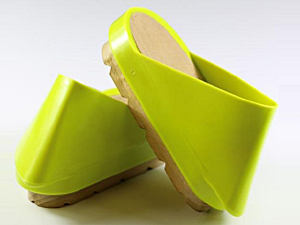 The Moover cow slipper improves on the products currently on the market, by having a wooden block overmoulded in plastic. Inoplas took the customer’s initial idea and turned that into a feasible and cost effective design, right through to supplying the very first samples. The product will come in 3 sizes and in a range of very bright colours; we really hope the product gets Mooving into dairy farms all over the world!